If you are currently dealing with a divorce, it is extremely important that no time is wasted in getting the involvement of a high-quality San Fernando Valley divorce lawyer that you can trust to represent your best interests. At Cutter & Lax, Attorneys at Law, we know just how difficult it can be to deal with the process of a divorce or any other family law related issue. We understand just how daunting it can be and are prepared to offer up our services as reliable attorneys to help make the process easier. Regardless of whether you are looking to obtain a legal separation, if you aren't even sure what the grounds for divorce are or if you are looking for a peaceful uncontested divorce, you can trust in the legal experience of our firm to help. Facing a divorce? 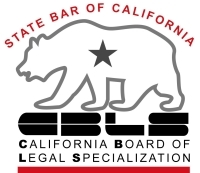 Work with an attorney who has been board certified by the State Bar of California Board of Legal Specialization in family law. Click here to request your initial consultation! At our firm, we pride ourselves on providing clients with exceptional legal services. In fact, this commitment to the success of our clients has resulted in several happy clients throughout the years. To see for yourself, all you need to see is the numerous testimonials and reviews we have received. For example, we have clients who have claimed that they were "extremely impressed" with our firm. We have also been told that we "were always personally accessible" and that because of us, our client's "alimony payments have been cut almost in half." Don't you want that level of high-quality legal representation on your side? At Cutter & Lax, we know how much is on the line with any given family law case; we know that you are probably looking for a lawyer for your divorce in Encino. We want you to know that you can trust in the legal experience from our firm. We encourage you to check out our blog watch our videos or even read through our FAQ section to get reliable answers to commonly asked questions. If you have further questions that you would like answered or if you would like to discuss your case with a knowledgeable Encino divorce attorney from our firm, we encourage you to contact us as soon as possible. To set up your initial case consultation, you can give us a call at (818) 839-2533 or you can simply email us directly through our online form. Attorney Nelson Frederic Cutter brings more than three decades of legal experience to the firm. Mr. Cutter graduated from California Polytechnic State University, San Luis Obispo in 1975 with a B.S. in Agriculture before attending California Lutheran University, where he graduated in 1980 with his Masters in Business Administration. From there, he attended Pepperdine School of Law, where he received his Juris Doctorate in 1983. Mr. Cutter was admitted to practice law in the state of California that same very year. Since then, he has gone on to hold several different positions—each helping to broaden his understanding of the law. For example, Mr. Cutter served as Deputy District Attorney for El Paso County in Colorado for two years. He has also served as Chief of Legal Assistance at White Sands Missile Range in New Mexico and is a retired JAG officer. As a retired reservist with enlisted experience, he is able to bring unique insight into the complexities of military divorce. He has also served as a high school teacher at Monroe High School in North Hills, CA. This experience has allowed him to be especially delicate with child custody cases, giving him a perspective that few divorce and family lawyers in Encino could bring to your case. Attorney Matthew Lax is a certified family law specialist who graduated from California State University, Northridge with a B.S. in Political Science before attending Whittier Law School and obtaining his Juris Doctorate. Since his graduation, he has been admitted practice law in the state of California, as well as all of the Federal District Courts within the state. He is well known throughout the San Fernando Valley as being a highly experienced, creative force in the courtroom—helping clients with all types of complex family law cases. Mr. Lax is a member of the San Fernando Valley Bar Association, Family Law Executive Committee and is also a volunteer Daily Settlement Officer/mediator at the Chatsworth and Van Nuys Courthouses. Regardless of your situation, you can trust that he will do everything he can to help. Need a divorce lawyer in Encino or San Fernando Valley? If you are currently facing any type of family law case, we encourage you to get the involvement of a divorce attorney in the San Fernando Valley. With years of experience, we are prepared to help with a wide variety of complex family law related cases—from annulments to restraining orders. We are also able to step up and help our clients protect their families, working tirelessly to fight for just child custody arrangements and fair visitation rights; we can also help to establish or de-establish paternity, help if you are planning to move away or help determine that a fair amount of child support is being paid. Considering divorce? Have child custody or support issues? Visit our Encino family law office!